About 15 years ago, I was inspecting an abandoned home in Pacifica. I was told by the Realtor not to go into the back yard because a vicious dog was there. What I saw (and heard) was not a viscious dog, but a starving dog. His bark was one of desperation, not malice. The dog was about 20 pounds underweight. I immediately entered the back yard and started petting and talking to the dog. I was told by the Realtor his na me was Brutus. I continued on with the inspection. At every interior window that faced the back yard I inspected, Brutus would jump up and bark. By the end of the inspection, my heart was won over. I opened up the back door to my truck, and he jumped in. I drove him to Pacifica Pet Hospital to get the full workover. Unfortunately, the next day, I was leaving for Hawaii for a week vacation...the only time I regretted going on vacation. When I arrived back in town and picked him up, Brutus was no longer in the kennel, but sitting at the feet of the receptionist at the Pet Hospital. Another heart was won. He has come to be the gentlest, smartest, most loyal dog I have ever had. Well, needless to say, in the following years, he has gained back the lost weight, won over the hearts of scores of people, and inspired many more to take in a rescue dog. He is Brutus, the Wonder Dog. For further information about rescue dogs, visit the Peninsula Humane Society Website. 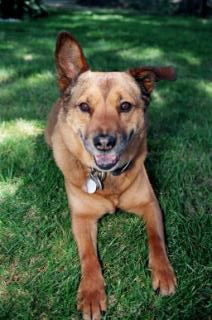 On October of 2010, Brutus was diagnosed with a malignant melanoma tumor on the back of his tongue. Through the excellent work of Dr. Choi at Pacifica Pet Hospital, the tumor was entirely removed. Since the operation, Brutus has been receiving a melanoma vaccine from San Francisco Veterinary Specialists that had not yet been approved for humans, but has been approved for dogs. This vaccine, which is non invasive, can prolong his life anywhere from 1 to 2 years. In July of 2012, he was found to be cancer free. In December 2013, Brutus' x-rays confirmed cancer in his lungs and his prostate. It is with a broken heart, I report that on February 28th, 2014, Brutus succumbed to cancer. His oncology vet declared that he was the longest surviving dog to his knowledge, living a good life for 3 years and 3 months after being diagnosed: a miracle dog. Even through his last days, he remained loyal and gentle. He blessed us every day he was alive.